Ritu and Vishal are an adorable power couple. Vishal is a brilliant merchant. And Ritu is a glamorous and elegant woman who is also a partner at Petit Royal, a multi designer children’s brand. Even before they scheduled the session with us, Ritu knew what she wanted for her pregnancy photo shoot. I was vacationing in New Zealand at the time but we kept in touch, coordinating and discussing her photo session which was to happen soon after I returned to Mumbai. 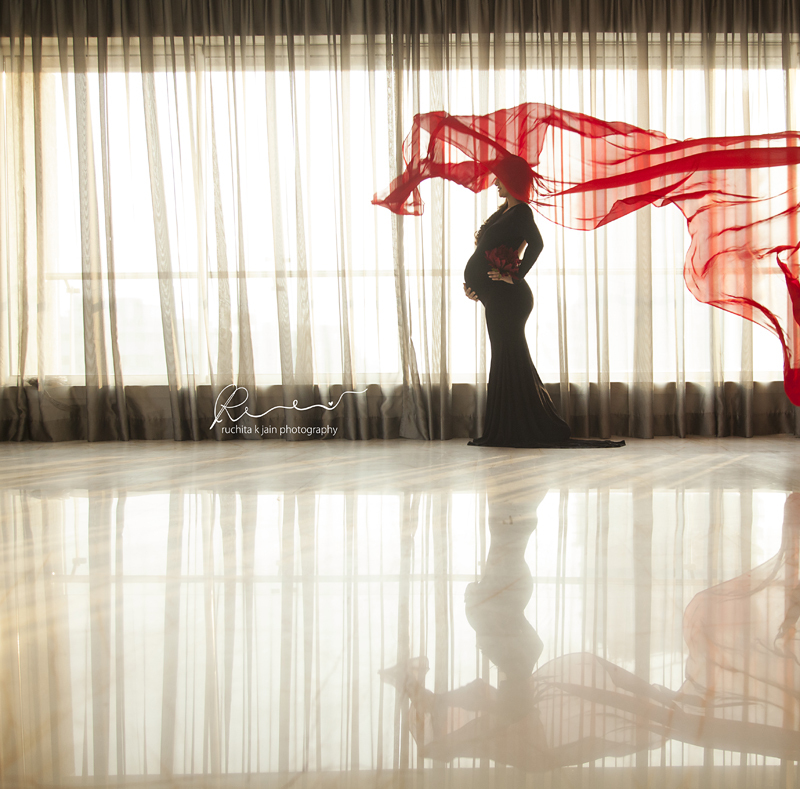 While I was away, Ritu did everything she could to get things ready for her maternity shoot. She even found and got the flower props herself. During the photo session she was very specific about the way she wanted to look and the kind of shots she wanted. Despite that, she was also very patient through the session, she understood my creative process. Ritu’s husband, Vishal, was there with her, supporting and taking care of her throughout our session. He also assisted with styling her outfit and made sure his wife looked the best by helping her get her poses just right. Vishal kept joking around Ritu and making her smile and laugh, in a way that only he could. When I look back on this session, I remember all the chatting and laughing, throughout the photo session. It was so much fun working with Ritu and Vishal, even as they were getting ready to bring a baby into their world. On 21st of November, Ritu and Vishal welcomed their baby boy and named him Ayaan. We loved the couple so much during the pregnancy shoot that we decided to gift them a Newborn session when we heard about baby Ayaan. They were excited about it too. We chose a simple and classic white theme for the session. This time, Ayaan’s grandmother was also at the shoot to help, us and the new parents. She made sure that the baby was soothed. She helped with making him sleep so we could click some cute sleeping pictures of the baby. In the end, both sessions were enjoyed, not just by us but also by Ritu and Vishal. What’s more important is that they loved the pictures and we had another happy client.